This new client came to me looking for help in her dining room, living room, reading room and den. We had such fun bringing her visions to life - she already had a lot of wonderful elements in her new home, which made adding to them that much more fun! 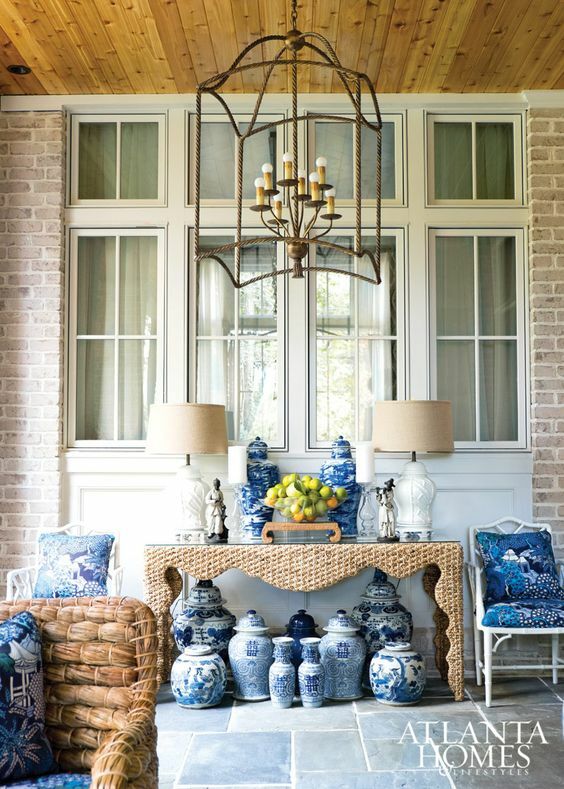 I’m particularly found of her dining room, which formerly served as a sun room, where we created a truly unique room that showcased her eclectic and nature-influenced style. Thank you Silver family! This new client was a referral, which is always nice to have. We worked together on her master bedroom as well as transforming her dark and somewhat dated den into a more fun and and bright place to hang out for the whole family! We kept their brown sectional but updated the lighting, accessories and ottoman to mix up the look of their entire space. Thank you Seaman family! It’s always good to mix it up by doing something completely different - this playroom was just the ticket. Fun and bright and perfect for their visiting grandchildren. Thank you Mills family. This next client was also a referral from a former client way back when! They were transitioning into their new home and looking for a whole new look - together we tackled their dining room, great room and master bedroom. I love the neutral palette that they choose and had such fun creating these new spaces for them. Thank you Samuelson family. This client was also transitioning into her new home and I’ve had the good fortune to help out in a variety of spaces including her master bedroom, living room, den and now music/office room. I can’t wait to pull the details of this room together - we’re really playing up the already dark and cozy room and it just might be one of my favorite spaces to date! Particularly love that leather chair and ottoman … I’d certainly love to curl up with a good book in that cozy corner. Thank you Morris family. 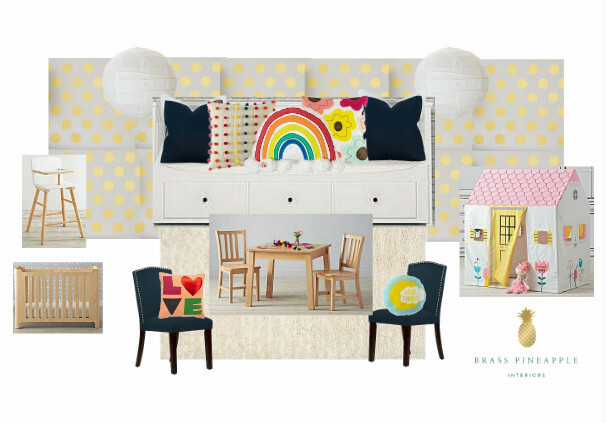 And, finally, a project close to home - a bedroom makeover for our oldest tween daughter! We’re nearly there on this one and loving it! So there you have it - a glimpse behind the scenes in my design world. Hope you enjoyed! 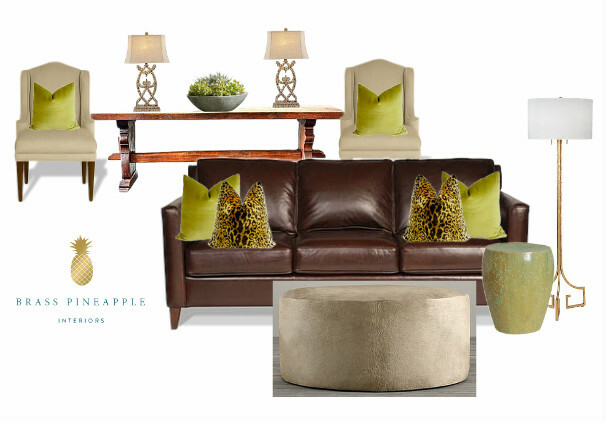 In case you missed it on my last post, I'll go ahead and shout it out again - Brass Pineapple Interiors is going retail! What does that mean, exactly, you say? I'll tell you. We've decided to open a small space in a multi-vendor design shop here in Charlotte, Cotswold Marketplace. If you're local and have never been to Cotswold Marketplace, now you have one more good reason to go! There are loads of different vendors carrying a variety of items - from lamps, to pillows, to custom furniture & drapery, tons of artists and so much more. Plus, tucked way back in the corner is a brand new little booth near and dear to my heart. It's mine, if you hadn't already guessed! 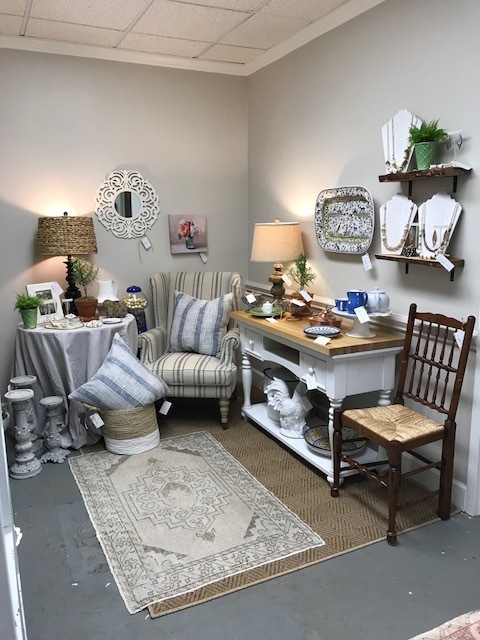 It's just a small space (expanding this weekend), filled with everything that I love - like European influenced furniture and accessories, kitchen and entertaining wares, as well as charming outdoor accents. And, of course, fun jewelry that I love. OH, and a gum ball machine, too! They'll be lots of changes in the coming months - as I slowly figure out what I'm doing! In fact, some of the items in these pictures have already sold and been replaced with new things. So far, that's the most fun (and challenging) part - keeping it fresh and exciting for all those lovely shoppers! The most recent installation includes a beautiful iron and marble plant stand, with a brass lion- head planter ( among other things). You'll just have to check it out ... in picture or person! But, seriously, more changes happening all the time. Like these fun finds that I hope to get into place for the weekend. Fingers crossed! Time is flying by...Spring has sprung and school is almost out for Summer. What the what?!? A friend introduced me to the Keto lifestyle, which has paved the way to a whole new collection of recipes. We're trying all sorts of new and different alternatives to your standard carbs. A recent hit was this cauliflower risotto with mushrooms and peas - delish! Find the recipe here. After taking over a small section of our guest room for an office, then never using it and selling off all the pieces ... the office is back, bigger and better than ever. It's taken over the whole former guest room! It's definitely a work in progress, incorporating the antiques takes a little effort (worth it, tho!) but I am loving having a creative nook of my own. 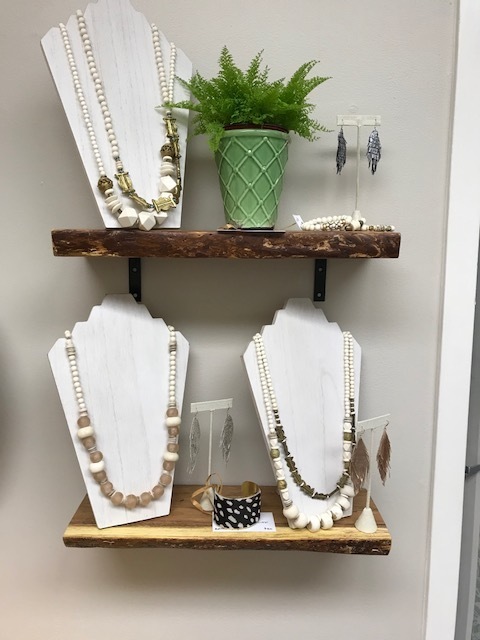 And, in the final bit of news and one of the biggest factors in creating the bigger office is that I have decided to expand my business by opening a small design retail space. The space will be heavily influenced by all the things I love the most - pairing European influenced furnishings with more modern pieces, cooking and entertaining with style, as well as creating a charming outdoor space. I'll definitely be sharing more details as I go along! For now, there's much to learn and lots of research to be done. If the pollen we're seeing in Charlotte is any indication, it seems like Spring might finally be here to stay! Which means it's almost time to give our outdoor spaces their Spring time cleaning. And, if you're anything like me, that might also include a little Spring time refresh. You may remember our Summer refresh from last year (read about it here ), but it will come as no surprise that we'd like to mix it up again. Partially inspired by the porch from our Spring Break trip and partially due to necessity we (ok, mostly me) have a couple ideas we're throwing around. 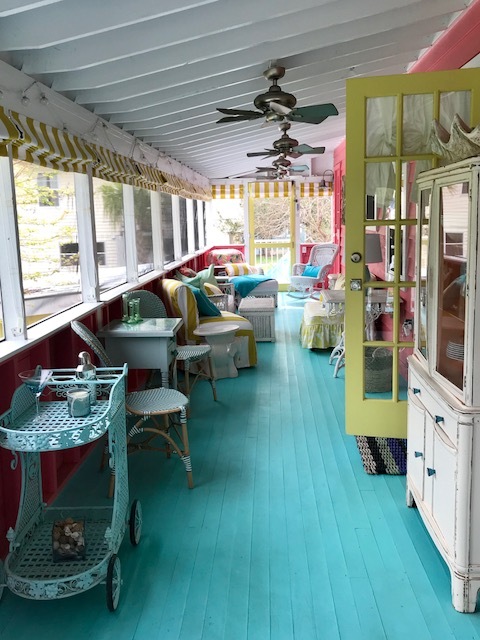 Take a look at some of these super inspirational porches that have gotten the old wheels spinning! The biggest change I'd love to make is to loose the black stained wood flooring, railing and steps. I'd love a more muted color similar to the grey in the above image. Sadly, I don't even know if this is possible, but it's definitely worth looking into! Does anyone know if this is possible without stripping the wood all the way back to it's original state? If the first change on the wish list is a doozey, this can be the opposite - adding more lights. 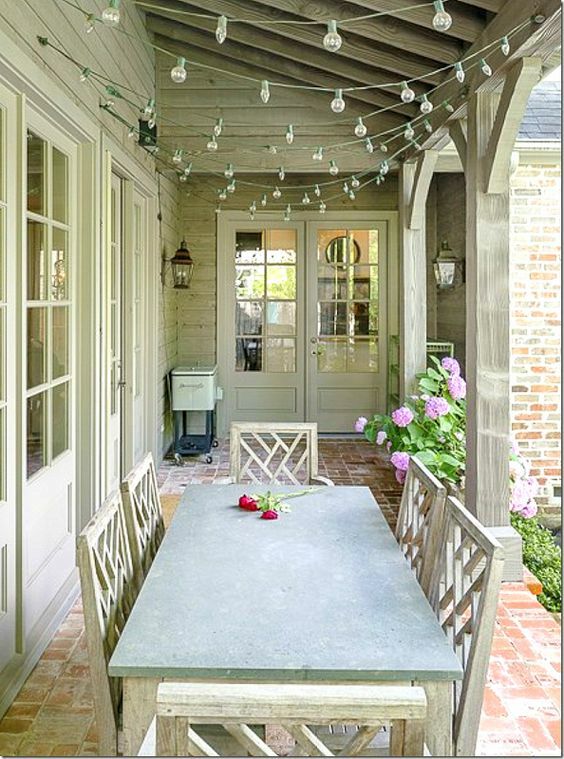 We currently have lights draped over the patio, but we'd like to extend them onto the porch for some added ambiance. Easy enough, amiright? Time for another big change to add to the wish list...privacy shutters on the far end of the porch. Not because we feel overlooked, honestly, more because the porch is always so dirty and a screen might cut back on that. Plus, it's just so cozy. You know me and cozy, hand in hand. Lots of love for coziness around here. I'm including this image in my inspirational round up because I just love how the space makes me feel. A true reminder to carry the indoors out and vice versa to create one unified space. Last year, we added a fun art piece to our patio - making what used to be an empty corner feel much more loved and full of personality. Hopefully I can find more ways to continue that feeling throughout the porch. We shall see, lots to think about! With a house. A region. And two towns, in particular. Yup, it was a big week. Welcome to Sundew Cottage on the ecclectic island of Tybee, Savannah's beach town. We knew we wanted to explore Savannah with the kids, but also wanted to squeeze in a little beach time, if we could. Staying in this adorable cottage was just a perk that came along with the trip, but truth be told, it was much more than a perk - more like a highlight! The screened-in porch being the true gem of the cottage - Great for sun drenched mornings, afternoon naps, family dinners and chilly evenings, too! 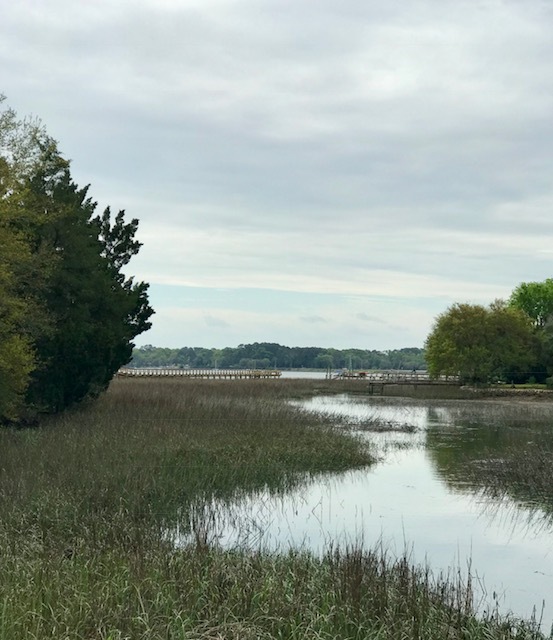 We explored Savannah by day, dining out and taking in all the city had to offer than slipped back to the cottage in the late afternoon to enjoy a dip in the pool, cook a meal in the gourmet kitchen and enjoy a glass of wine (or two) by the fire at night. It was truly delighful. Some of the highlights from Tybee were: the Social club for Blue Grass Brunch, The Cafe & Bakery on 80 for take away lunch, The Crab Shack for creekside dining, Wiley's Championship BBQ for really good ribs, and Scuba Steve's Seafood for shrimp right off the boat. Honorable mention to Gerald's Pig & Shrimp, which was closed when we tried to go, but looked so fun! We spent a couple of days wondering through Savannah - taking in the squares, the architecture, the atmosphere and, of course, all the good eats! Most notably, we enjoyed the Old Savannah Trolley Tour, which was a great way to keep the kids engaged while we explored the whole historic area. The kids also loved the Dolphin Magic Tour on the river, which allowed us to view the two local forts and the Tybee lighthouse. For lunches we enjoyed the Old Pink House as well as The Little Duck Diner. Of course, no trip to Savannah would be complete without a visit to Leopold's for ice cream made the old fashioned way. Special shout out to The Grey, which we wanted to try but just couldn't make it work. Our last day was a dreary, rainy one - we decided to skip town early and head home, but first ... a detour! Not just any detour, only the best detour to date - to Beaufort, SC. What a cute little waterfront town!! We only stopped in for a couple of hours, just enough to grab a great lunch at the Wren, walk the main street and take a driving tour of the historic district - including the house from the Big Chill! Next time we'd love to take the historic home tour via horse drawn carriage, Southern Rose Buggy Tours. We had such a nice time touring this lovely area of the South that we're already making plans for another get away. And, of course, it's inspiring a project at home too!